Sorry that there was no newsletter last month. President Diane Clarke was in the UK and then on holiday in Croatia and Vice-President Carol was touring India so there was nobody available to write one. The main event for the International Theatre Studio during the summer was the Charity Concert in mid-September, which many of you attended, but more of that later. Also, Carol organised an enjoyable play-reading in July, which was well supported for the time of year. to enjoy the entertainment and the picnic in the park and we have heard many complimentary comments about the evening. Norman Robbins and will be performed at the Atalaya Park Hotel Disco on Friday 23, Saturday 24 and Sunday 25 November. More information will be sent out nearer the time but we have started rehearsals and are hoping many of you will be coming to see it. We wonder how many will be able to “spot the killer” before the twist at the end! Our Murder Mystery season starts again in October with a performance for Los Arqueros Golf Club members on 26 Oct, followed by one for CAP members on 2 Nov. The International Theatre Studio will also be performing the current Murder Mystery at other venues during the winter and we are presently in the process of arranging for a performance at a local restaurant so members of the I.T.S. can come along, have a meal and solve the murder! Due to present commitments this will probably take place early next year but we will keep you informed. will be booking an appropriate venue within the next two weeks so would like to know your views as soon as possible. Mary for all their hard work and dedication over the years. We hope to mark Clive’s “retirement” at our Christmas celebration before he and Mary go off on their exciting, extended cruise and visit to Australia. Clive’s departure means that the International Theatre Studio will urgently need to find a new technical expert. We have been asking for volunteers for some time now but haven’t managed to find anyone. Would you all please tell everyone you know that we are looking for someone to join us who would like to undertake lighting and sound and be a valued member of the Drama Group. Just before finishing we would like to tell you that the I.T.S. Carol Woolnoth hosted another very enjoyable play-reading evening in July, at Bar El Candil, which was very well attended. reading will be held in October on a date yet to be arranged - but avoiding the San Pedro Feria. Rehearsals for the very popular Summer Charity Show are going well and everyone is looking forward to the evening. The show is being held in the beautiful Parque Leonera in Benahavis, on Sunday, 16 Sept., starting at 7pm. Tickets will be available from all the usual outlets and on the gate and information on this will be sent out nearer the time. This year our chosen charity is Age Concern, Estepona and representatives of the charity will be there on the night to talk about the work they do in Spain as well as in the UK. Don’t forget to bring your picnics and drinks to enjoy in the interval and to bring a cushion to sit on in the amphitheatre! After the Summer Charity Show we’ll be starting rehearsals for our autumn production “Prescription for Murder”, a thriller by Norman Robbins, which will be staged in mid-late November. Fred is liaising with the Atalaya Park Hotel director re the dates the stage will be available and we hope to have news of that soon. During the autumn we’ll also be starting a new season of Murder Mystery Evenings at various venues so I hope that you’ll all be able to come along to one of them. We have several dates arranged and details of those will be sent out nearer the time. As you can see from the above the International Theatre Studio never sleeps and we’re always busy planning for your future entertainment. Barbara Mitchell and Diane Clarke will be visiting the Theatrical Book store in London shortly to find more plays to bring to the Costa del Sol. Of course we might just combine it with a little light shopping and some lunch! We hope to see you in September/October when the new season begins. Don’t forget to tell your friends about all the events we’re arranging and get them to come along; we always love to welcome new people and get them involved in the world of the theatre. It's great to be back here enjoying this gorgeous weather after spending a few weeks in a very wet UK! We felt sorry for all the people who had trekked to London to watch the Diamond Jubilee celebrations only to find it very cold and damp. It didn’t appear to dampen their spirits however and they all seemed to enjoy it as much as those of us who celebrated it here did - with the bonus of lovely sunshine. Firstly, thank you to Kate Jackson for organising a very successful reading of the comedy “Dirty Dusting”, by Ed Waugh and Trevor Wood, on 6 June. It was very well supported and the evening was a lot of fun. We have another play reading scheduled for next month, this time organised by Carol Woolnoth. The play is “Just the Two of Us”, by Ros Moruzzi, and is a very funny comedy exploring the impact and repercussions of modern science on a couple who discover there are more members of their family than they thought! There are six characters in the play so plenty of opportunity to take part in the reading if you would like to do so. This event is being held at 7.30 for 8pm on Wednesday 18 July at Bar El Candil, San Pedro and more information will be sent out nearer the time. Our next major event will be the very popular summer charity show, Fun in the Park, to be held at the beautiful venue of Parque Torre Leonera, Benahavis, on Sunday 16 September at 7.00pm. This year the chosen charity is Age Concern, which does a wonderful job advising and assisting the “not-so-young” both in UK and abroad. The International Theatre Studio board members have put together an excellent programme of music, comedy and drama to entertain you and don’t forget to bring your picnic to enjoy during the interval. Further details of this evening will be sent out later but put it in your diary now! King. Auditions are being held on Monday 25 June at 7.30 pm for 8pm at Bar El Candil in San Pedro. There are three female and three male roles and details of the characters have been sent out recently in the Audition Notice. Information also appears on our website, www.internationaltheatrestudio.org/. please let Diane know on 952 92 81 96. Secretary over the last few years. productions, and we welcome her to the Board and promise to try not to overwork her! As Diane Clarke is away in the UK enjoying the wettest drought for years Clive Jacklin is keeping you up to date with the latest news from the International Theatre Studio. In April we had a very successful Play-Reading at El Candil in San Pedro de Alcantara hosted by Carol Woolnoth. It was well attended and those present enjoyed the two comedy plays “What’s for Pudding” and “It’s a Dog’s life”. We had one or two new faces who were very welcome and in fact we have been able to cast one of them in a play to be performed in September. More on this later. We have another Play-Reading planned for the 6th June, again at El Candil in San Pedro de Alcantara. Kate Jackson will be hosting this Play-Reading. The play chosen is “Dirty Dusting”, an adult comedy by Ed Waugh and Trevor Wood. It was premiered at the Customs House South Shields in February 2003. During the next few months we hope to be performing some short Murder Mystery Plays at various venues, as we did last year, so keep a lookout for further information. Our next major production will be our Summer Charity Show to be held in the beautiful Parque Torre Leonera, Benahavis, on Sunday 16th September at 7.00pm. Although final details are still being worked on it will follow the same format as last year. Some of our audience thought that the first act was rather too long, so this year it will be no more than 45 minutes with an interval of 75 minutes for picnicking and then about 40 minutes for the last act. In the first act we will have a variety of singers, musicians and possibly a short comedy sketch. In the second act we will be performing “What’s for Pudding”, a one act comedy by David Tristram and directed by Kate Jackson. We will be sending out further details nearer the time. typewriter, so if anybody has one they can donate to us we would be very grateful, bearing in mind it might not be returned in the same condition. Audition notices for this play will be sent out in June. Last week's evening of play-readings went very well. for Pudding for the charity show in Benahavis. We had some new readers, although not all those who had said they would come managed to get there, sadly, or we would have had some more new ones. We also signed up some new members. existing members and having started promptly at 8pm with a break for drinks between the two readings we finished by 9.20 pm. Tapas was arranged for 9.30, so it all worked out well. On 16th March our production of Simon Williams's one-act play "Happy Birthday Me" was performed in Gibraltar as part of their Diamond Jubilee Drama Festival. A professional adjudicator was present and gave marks and a constructive critique for all the plays performed in the competition. Our play was chosen to be performed again on the Gala Night to provide a rounded and enjoyable evening's entertainment, which was quite a compliment. We won the award for "Best Set Design" – Fred Wallis and Diana King, and members of our cast achieved nominations in the categories of "Best Actor" – Michael Clarke, "Best Actress" – Diane Clarke and "Best Supporting Role" – Diana King. We received lots of compliments and kind words from many members of the audience and from the organisers and we're all agreed that it was a very interesting experience and we have learned more about the art of theatre by taking part. The following week we performed a double bill of comedies at the Atalaya Park Hotel for our usual Spring Production. "Happy Birthday Me" was performed again, followed by "Getting Along" by Charles Mander. The weekend was a busy one in the area as several other big events were taking place so the competition for "bums on seats" was fairly intense. We were therefore delighted to find that our audiences gave us such good support and we hope that they all enjoyed their evening with us. Judging by the amount of laughter that could be heard in the theatre the plays were generally very well received. Whilst putting on two plays was quite a strain on our acting and back-stage resources, it gave new members of our drama group an opportunity to take part in a mainstream production, which is good news for us and is good experience for them. Back to our forthcoming events. The International Theatre Studio is arranging two Play-Reading Evenings during May and June and possible plays are presently under discussion. More information will be sent out as soon as details are finalised and we would love to encourage members and others who are interested in play-readings and amateur dramatics to come along and either take part or just relax and enjoy the evenings in social surroundings. Ginger - a bouncy and excitable young pup, male or female. We hope to see you there for an enjoyable evening. The I.T.S. President and Board are sad to have to tell you of the death of our Vice- President, Ann Shaw. Ann was one of our longest serving members, a regular actor and director of many of our productions. At the service of celebration of her life on the 27 January 2012 her daughter Carol read an eulogy which you can read below. She will be missed so much by so many of our members. I would like to share with you some of the extraordinary events in my mum’s life. She was quite a private person and many of you may not know any details of her life before she came to Spain in 1985. She was born in Hope Hospital in Salford, Manchester and lived in Priory Avenue, very close to The Cliff, which was then the training ground of Manchester United and she was made of the same flair, grit and determination for which this team is rightly famous. One of my mother’s earliest memories was sitting on her father’s shoulders on the terraces of the Stretford End at Old Trafford watching United play: something which remained a lifelong passion. The ITS are taking part in the competitive Gibraltar Diamond Jubilee Drama Festival which runs from 14th to 17th March. 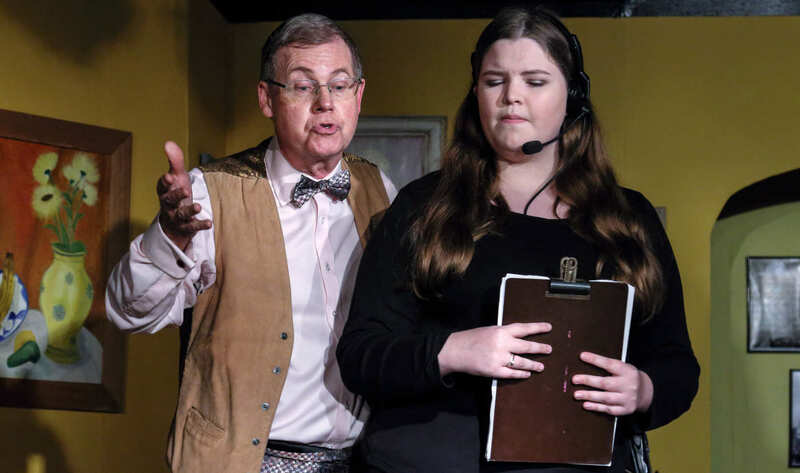 Eight one-act plays are being performed in front of a professional adjudicator who will assess them critically and award prizes in a number of categories such as Best Play, Best Director, Best Actor, Best Actress and for several other theatrical aspects. The ITS play is "Happy Birthday Me" by Simon Williams (possibly better known as an actor, particularly for playing the son James in the long-running TV series "Upstairs Downstairs"). The play is set in a retirement home for elderly actors and is a moving bitter-sweet comedy which we think and hope audiences will enjoy. We are performing it at Ince's Hall, at the south end of Main Street, Gibraltar, on Friday 16th March, when two other plays entered by other societies will also be on. It should be pointed out that the ITS are performing the play again the following weekend (23-25 March), this time in our normal venue of the Atalaya Park Hotel disco, along with a second ITS one-act play, so that together they will comprise a "double bill" of theatrical entertainment. Visitors to this website will have the option of seeing the play in Spain or Gibraltar. Tickets for the Gibraltar Festival can be reserved by ringing the local Box Office on +350 2007 5826.